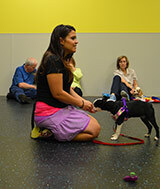 OCEANSIDE PUPPY KINDERGARTEN CLASSES & OFF LEASH PUPPY SOCIALIZATION!!! Karma Dog Training has created a dynamic 8 week, puppy kindergarten and puppy socialization class consisting of over 10 hours worth of instruction designed to give Oceanside dog parents and their newest addition to the family the headstart in life he or she deserves. Endorsed by Veterinarians, Groomers, Animal Control Officers and Doggie Daycare Professionals throughout Oceanside, we give unprecedented care and attention to each puppy. Taught in a state-of-the art, indoor, climate controlled, spacious room, the grounds our kept immaculate as they are parvo and distemper disinfected before each class. This allows maximum safety and comfort for your new puppy! By offering weekly puppy kindergarten and puppy socialization classes for puppies between the ages of 8 weeks and 18 weeks of age, Karma Dog Training offers Oceanside puppy owners a safe and supervised place to bring their not-yet-fully vaccinated puppies to immediately begin the process of "safe socialization". In our Oceanside puppy kindergarten and socialization classes, your puppy will also learn important bite inhibition skills. Furthermore, we give you a greater understanding of your role in your puppy's behavioral obstacles and how they originated. We then provide you with many practical applications on how to overcome them, turning them from potential negative experiences into positive healing opportunities.